The Terracotta Army or the "Terracotta Warriors and Horses" is a collection of terracotta sculptures depicting the armies of Qin Shi Huang, the first Emperor of China. It is a form of funerary art buried with the emperor in 210–209 BCE and whose purpose was to protect the emperor in his afterlife. The figures, dating from approximately the late third century BCE, were discovered in 1974 by local farmers in Lintong District,Xi'an, Shaanxi province. The figures vary in height according to their roles, with the tallest being the generals. The figures include warriors, chariots and horses. Estimates from 2007 were that the three pits containing the Terracotta Army held more than 8,000 soldiers, 130 chariots with 520 horses and 150 cavalry horses, the majority of which remained buried in the pits nearby Qin Shi Huang's mausoleum Other terracotta non-military figures were found in other pits, including officials, acrobats, strongmen and musicians. In 1974 the most important archaeological discovery in the world took place when more than 8000 life-size clay warriors were uncovered in Xi’an, China. 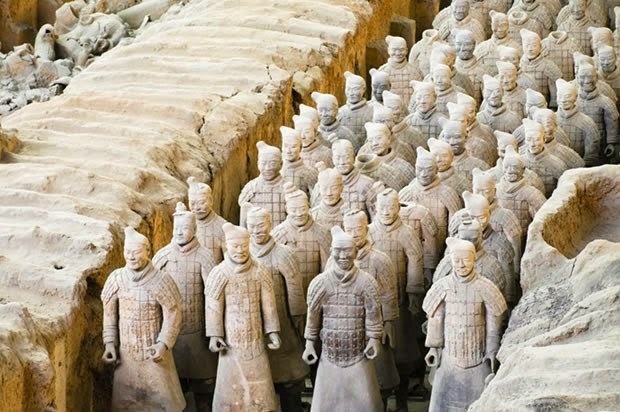 The clay army lies in the greatest mausoleum in the world, and archaeologists assert that it was meant to protect Emperor Qin Shi Huang in his journey after death. Each soldier was created with unique characteristics and was placed according to rank. Horses, weapons and other objects were also discovered. Qin Shi Huang was the first emperor of the Qin Dynasty. He became King at the age of 12 and lived in the 2nd century BCE. According to historical records, he had an army of one million professional soldiers built, and was the one who initiated construction of the Great Wall of China. Huang’s Mausoleum was a copy of his kingdom—which according to the records took 37 years and more than 720,000 people to construct—so that he could maintain his empire after death. The outer wall is about 2km x 1km and the Necropolis consists of buildings, cemeteries and stables, and there are four different pits in which the 8,000 warriors stand in rows. The tomb of the King has been located and is likened to an underground palace though it is yet to be excavated. According to historian Siam Qian, the tomb hides great treasures such as vessels, precious stones and treasures. Characteristically, Qian mentions: "Since antiquity, no one has ever been buried in such a luxurious manner as Emperor Qin Shihuang." The Emperor made sure that his tomb would be booby-trapped so that robbers wouldn’t be able to access it. It is mentioned that he used poisonous arrows that are automatically triggered, mercury, and other traps that could bring death upon any intruder. The secrets of the tomb are not known since most of the people that worked at building the Emperor’s tomb were killed; however, probes that have been sent into the tomb have verified an unusually high concentration of mercury exists, possibly supporting Qian’s theory. Recently, The University of Xi’an Jiaotong discovered that the tombs of the Han dynasty are embedded with astronomical information. Specifically, the murals on the upper part symbolize the sun, moon and the stars, while the lower part represents mountains and rivers. Now let’s connect Chinese mythology to the story of the Emperor. A Chinese dragon was said to consist of nine different parts, all resembling different animals: the head of a camel, the scales of a fish, the horns of a deer, the eyes of a rabbit, the ears of a bull, the neck of a snake, the belly of a clam, the paws of a tiger, and the claws of an eagle. According to this mythology, dragons were divine monsters, both wise and strong, that were involved in the creation of the world. Dragons were not considered to be evil creatures—this is something that was introduced later on by Christianity’s attempt to twist opposing myths and legends. In fact, the Chinese claim that dragons were present with humans in the beginning, helping humans evolve. They were respected and considered to be good fortune, and were advisors of the kings because of their great wisdom. They had the ability to change shape, size, and become invisible among many other abilities, like controlling the rain, the weather, and many other external aspects of their everyday life. It is said that the first mythological emperor (Fu Xi) of China had a dragon tail, and his successor is said to have been fathered by a dragon. If we compare these stories to that of other myths around the world, we will see the similarities with the first emperors, who were related to the ‘gods’ and ‘creators’ of humanity, the only difference being that the gods in Chinese mythology who gave the kings authority are depicted as dragons. Since the emperors of China were related to these gods, is it possible for the Emperor Qin Shi Huang to also be? There are still many relics to be found since most of the area is still unexplored, and archaeologists believe what has been found comprises only a tiny fraction of what is there. Unfortunately, excavations of the tomb have currently been stalled by the Chinese government. The Terracotta Army is one of the top attractions in China. It is significant because the hundreds of detailed life-size models represent the army that triumphed over all other Chinese armies and who were the decisive factor in forming a united China 2,200 years ago. It is considered one of the greatest archaeological sites in the world, and one of thegreatest discoveries of the 20th century. In 1987 the Tomb of the First Emperor, including the Terracotta Army, became World Cultural Heritage. Workers digging a well outside the city of Xi'an, China, in 1974 struck upon one of the greatest archaeological discoveries in the world: a life-size clay soldier poised for battle. he diggers notified Chinese authorities, who dispatched government archaeologists to the site. Ying Zheng took the throne in 246 B.C. at the age of 13. By 221 B.C. he had unified a collection of warring kingdoms and took the name of Qin Shi Huang Di—the First Emperor of Qin. During his rule, Qin standardized coins, weights, and measures; interlinked the states with canals and roads; and is credited for building the first version of the Great Wall. According to writings of court historian Siam Qian during the following Han dynasty, Qin ordered the mausoleum's construction shortly after taking the throne. More than 700,000 laborers worked on the project, which was halted in 209 B.C. amid uprisings a year after Qin's death. Qin's tomb itself remains unexcavated, though Siam Qian's writings suggest even greater treasures. "The tomb was filled with models of palaces, pavilions and offices as well as fine vessels, precious stones and rarities," reads a translation of the text. The account indicates the tomb contains replicas of the area's rivers and streams made with mercury flowing to the sea through hills and mountains of bronze. Precious stones such as pearls are said to represent the sun, moon, and other stars. "It is best to keep the ancient tomb untouched, because of the complex conditions inside," Duan Qinbao, a researcher with the Shaanxi Provincial Archaeology Institute, told the China Daily in 2006. 1) Qin Shi Huang’s burial complex was the largest in the world­—and it was probably never completed. 2) Qin was an effective and powerful ruler, but he was also known for his cruelty. 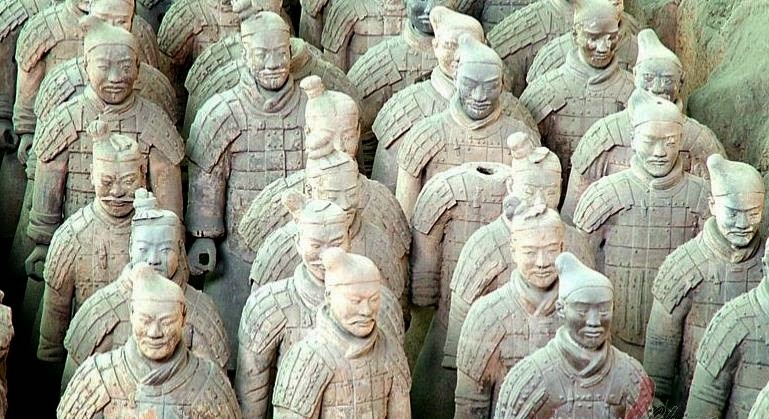 3) Each soldier in the Terra Cotta Army has distinct facial features. 4) Their weapons were extraordinarily well preserved. 5) The emperor’s tomb itself still hasn’t been excavated.